There is nothing worse than having the lashing on your favorite pendant come unraveled or ripping the necklace, rendering your piece unwearable. I have been sent many hooks and pendants (not my own work!) 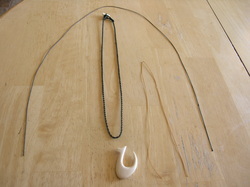 with unraveled lashings, needing new necklaces and sometimes even broken pendants. While re-wrapping lashings and making new necklaces is usually not a problem, broken pendants may not be repairable. Sometimes the only option is to make a new one. I don't like to copy other artists work, but with most generic hooks or shapes this is not an issue. If you have something needing repair, please don't hesitate to send me a message with a picture, detailing what needs fixing, and I will help you out as best as I can.